This "Challenge" is open to all K-12 art teachers around the world. Budgets are getting cut and we are being forced to find materials in the most unusual places. 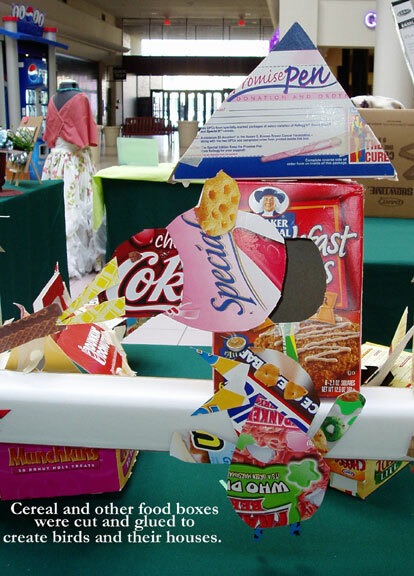 Your submission can be any recycled materials - or donated materials that you can scrounge. Include a brief list of found materials, name of school and grade level. America Recycles Day is November 15. See other recycling ideas! Kinderart - Elementary ideas - Many of these are more crafty - but you might find some good ideas to turn into art. Imagination Factory - This site has many lessons and resources related to recycling. I wanted to share and activity that I am doing with grades 3-8th. I have a bunch of binder notebooks that were donated to me. After checking with the Soc. Studies/and Language Arts teachers I came up with this curriculum for the first grading quarter. Some of the students are studying Early Rock Painting, etc. Students are given pictographs, signs and symbols and discuss the assignment, then each student is given a binder and tape their name inside. I introduce Gesso (they have to also add a art word list in their notebook) paint binders with Gesso to prime for design. Using the signs, symbols and pictographs the students must create their own picture language to design their notebooks. The first day we practiced the pictographs and many of the students wanted to draw scenes. To stir their imagination I asked what is the symbol for Nike shoes etc. and finally they start getting the idea. So once they complete the note books they will design a notebook divider for those that take violin, chorus, and ballroom dancing. I used one of the posted activities for the K - 2. They are making talking stones using paper clay. I showed them an image and then had them to create a design they liked. Most of them of course used hearts and circles. Once they make their stone shape I will have them use the end of their pencil to create a hole for their raffia and have a talking stone necklace. 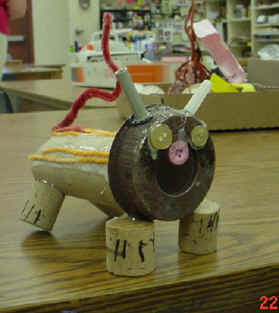 Students created a number of different sea creatures from a collection of recycled materials. Linda provided some of the materials and students brought in the rest. Encourage your kids to express their creativity as they discover, collect, sort, arrange, experiment, and think with found and recyclable "stuff." The real-life experiences of teachers and children will inspire ideas that you can try at home: choose objects and turn them into a display, transform materials into a face, build and glue wood scraps to make constructions. Appropriate for children four years of age and older. This is a mural Sarah did with her K-3 School for an Earth Day art project. Students saved colored scrap papers from their classrooms and scraps from the art room all year and we ripped them up and used the scrap paper to make a huge starry night for the art show and Earth Day concert. She was quite surprised when she stood back and looked at the results. They spent one week on it, each class helped out a little. The entire thing will be recycled after it is taken it down. 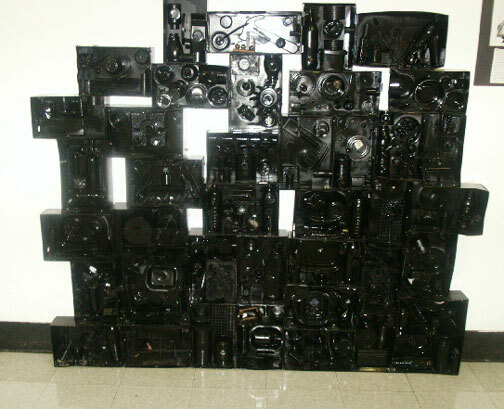 Students were introduced to Louise Nevelson's work. They used shoe boxes and found objects, to create this sculptural assemblage. Shown left" Pieced "trash" Quilt and flowers by third graders from John Fitch Elementary Shown right: Box Birdhouses and birds from George Washington Elementary. African tin art served as inspiration for the birds and birdhouses. These kindergarten assemblages are sure to bring a smile. Start collecting now. You never know what treasures might be hiding in discarded "junk." Jeryl did this lesson when kindergarten students were studying recycling. She pulled out boxes of stuff and tried to have lots of things that could connect themselves like twist ties, pipe cleaners, yarn, etc. It is good to have some making tape on hand, too. They did most of the gluing but she manned a hot Glue Gun for quick leg attachments, etc. Marker tops always get saved in her room. Its good to have a bucket for when a lid can't be found, but also they make great treasures for a recycle project. Include the list of recycled or found items with your projects. See the beauty is the photograph of the weaving below! 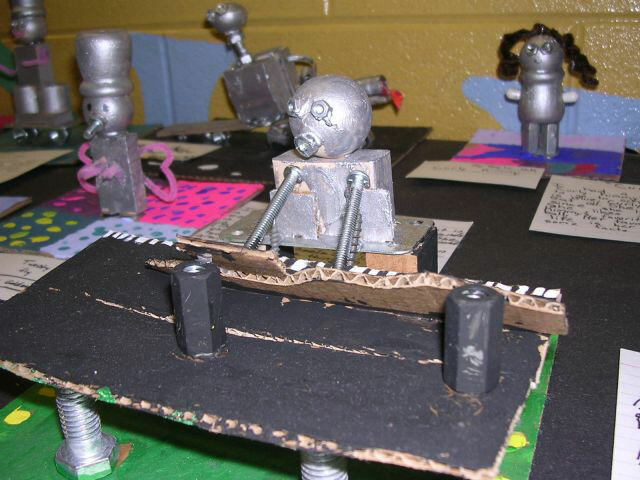 Robots using all sorts of found objects, bolts and wood scraps. Artist for inspiration - See Clayton Bailey Robots. Discontinued wallpaper books can be a regular gold mine of ideas for the art room. Christa Maria used wallpaper books for years. They where a staple in her classroom. 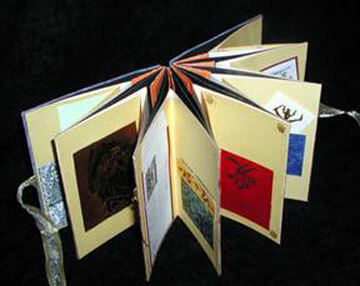 For collages, making booklets, they fold well for making small boxes. One of our fundraiser was making flower presses, finding wall paper that had botanicals and birds. The outer cover was made from Mat board scraps, a cut out of a bird or flower from wallpaper was added to decorate the mat board. Simple paper was cut to match the mat board tops and put in the inside. The 'pressing was done via two heavy rubber bands. They also used cut-outs from wallpaper books and decoupaged them on cheese boxes that she had collected. Borders can be cut and folded into little booklets to hold small school pictures. Something we did for Christmas presents - See sample above. Put little poems or quotes into the pockets. A lot of wallpaper also has beautiful small borders, that can be used to 'frame' a picture. Share your creative ways to use wall paper. Send in a sample of student work. Kris Fontes - Article Coming out Soon! Kris Fontes has found a use for the clear plastic forms that Sam's Club bathing suits come on. Sharon Kennedy turned the art ed list on to this great "find". Kris has about fifty of the plastic forms. She plans on doing a lesson with the language arts teacher. She teaches an elective called the Ophelia Project, which teaches self esteem, anger management, etc., to teenage girls. Kris has used the swimsuit forms with a women's group that meets once a week in her home town. Most of the women are not exposed to the arts in any manner and when they first saw the forms and heard the plans for each of them to collage the inside they thought it was a strange idea. They spent four Monday evenings working on the forms. Each of the women approached the collage differently - one used only coupons, another used images of the Virgin Mary, one had the photos of all her grandchildren incorporated into a flower motif, Kris' daughter Katie modeled her form after Frida Kahlo and Kris went the Art Nouveau route. It was fun for all and each woman took ownership of the individual form and made some great ART! Photo above is from "Celebrate Erie". They set them on wooden chairs with a small sign explaining the project. They left and watched as people stopped and stared and then came closer to each individual body. The "exhibit" lasted six hours and was a great success! Kris has already been to Sam's for more forms. For grades ½ the lesson was tied to their science unit on Balance and Motion. In grades 4/5 they did a unit on Op Art, concentrating on Bridget Riley. From Incentive Publications - Shared by Cindy E.: "This book has tons of ideas to do using pencil, paper, Crayons and things you can find around the house -- CHEAP. There are no objectives, standards included but you can add your own. No artists to draw from or interwoven cultural ideas but again you can add your own. Ideas are suitable for lower elementary but I have often added and embellished to stretch the ideas up to 5th grade. The best thing about this book is the volume of ideas and the inexpensive supplies used. The worst about any book like this is that there are a few ideas that are very crafty- always important to determine why you are doing a project and what you want the students to gain from this project. Also how can you add to it to deepen, broaden, enrich and challenge. Open-ended crafts can be valuable if the students are forced to solve problems and to come up with unique ideas rather than pre-determined outcomes that all look alike." 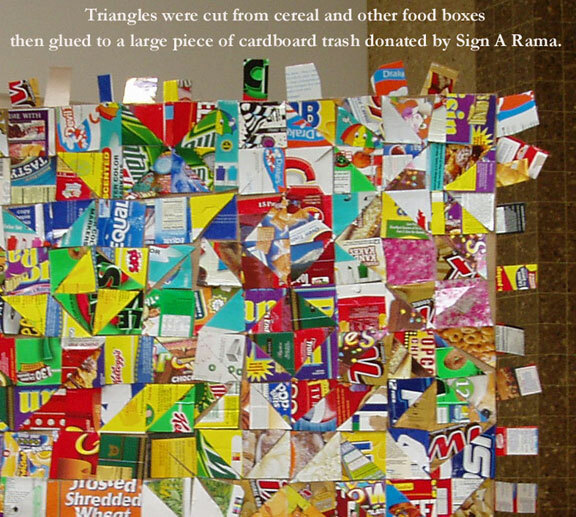 Trash for Teaching from Gardena, California. A variety of items can be ordered - very economical. 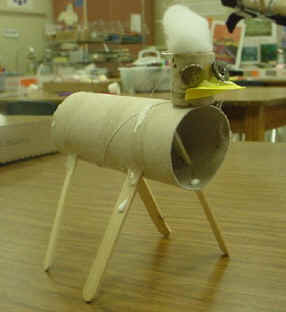 Trash Matcher - Easy project ideas from recycled materials by Marilyn J. Brackney. See what clever ideas you and your students can come up with. Chris Gilmour - Sculpture from Corrugated Cardboard - Life size constructions - cars, bicycles, typewriter, piano - more. Church models. Weird Gardens - Timmerman Daugherty - Browse the gardens - then be sure to check out the Gallery, too. I will add a link on the "Art on a Thread" page. Tony Price Atomic Art [Archive] - Look at sculptures and photo gallery. Art on a Thread? Stretch your budget. So you have inherited pounds of faded construction paper. What do you do? 1. Handmade paper - mix with regular cotton linters as construction paper are "short fibers" - you will need some longer fibers for better paper. Add some tissue paper scraps for brighter colors (Or even color with regular Kool-Aid - your hands will stain, too, with Kool-Aid). Try some Pulp Paper Painting - See Denise Pannell's lesson plan. 2. Laminate paper sculptures. I have only seen this - have not tried it myself. Laminate sheets of construction paper together with glue - make at least ½" thick. Weight down until dry. Cut out shapes with scroll saw or coping saw. You will see all of the colors you used around the edges. You could use good construction paper on the outside. Brush with clear gloss when finished. I saw these made by middle school students a number of years ago. 3. As a ground for oil pastels, soft pastels, tempera painting. Use all of the ways you would use gray bogus paper. Use as a middle ground for Charcoal /white chalk drawings. Black glue outline - with oil pastels, soft pastels. Tempera batik.... Oil pastel landscape collage was a lesson I did with 6th grade. Students colored on strips of construction paper - then tore a part to create a collage (sorry, I don't have examples of this online). I used black - but you can use any color. Try dipping soft pastels in sugar water - or white tempera... so many possibilities. 4. For crayon or oil pastel engraving/etching. Color heavy. Paint with India Ink or black tempera - scratch off the ink when dry. Do drawing with black Sharpie and color heavy. You will be able to see the drawing under the ink (just add a touch of dishwashing liquid into the ink or black tempera). 5. For paper sculpture where color isn't as important... How about Mark Anderson's architecture lesson? Also as the sheet under Norma's Ribbon letters/Ruscha style drawing. A dull color might look nice contrasting with the white paper letters. 6. As a layer for paper mache where bright colors are not needed... like animals or masks - muted base coats would be more desirable there. Tear into small pieces and soak a little in water before dipping in paste - that will get the pieces smooth. 7. Torn paper landscape collage. These can be very attractive with muted colors. Try painting the strips first with water colors (See lesson plan). 8. Paper weaving - do some watercolor paintings on the paper for interest. Weave two sheets together. Also Larry Prescott's tempera painting weaving lesson plan. 9. Bleached line drawings. Use darker colors and Q-tips or old brushes. Outline and pattern bleach lines with ultra fine point Sharpies. See Linda Woods site for some samples. Linda uses bright colors - but these look good on faded paper, too. 10. 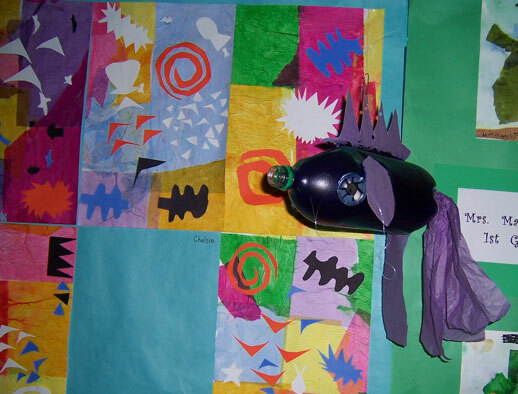 Paint/stamp with patterns and use for Picasso and/or Matisse inspired collage. Pattern/paint and use for Eric Carle inspired collage. 11. Have kids decorate with choice of media - then laminate to make portfolios. 12. And of course -- as table mats for all sorts of media. I did this with the faded large sheets that I inherited in my art room. I used them over and over again under all wet media - and as place mats for pastels, too. 1) Develop a class needs list that students can bring home or you can post online on a school web page (possibly your own). This can included recyclable items that typically involve no expense on the part of the donor. Things such as aluminum cans (soup cans on up to large coffee cans), plastic containers with lids (ice cream buckets, for example), scrap wood, rags, Styrofoam pieces from packing, wire (insulated and exposed), string, etc. 2) Check out businesses in the areas that might already have recyclable programs or would be interested in starting one for a tax right off. I used to use a massive sign company near my school from which I got an incredible assortment of materials that literally cut my art budget up to 60%. Many sign companies typically have lots of reusable paper and plastic sheeting that are end pieces from large projects that they have worked on, which are extremely useful in the art room. 3) Contact paint supply stores that have cans of latex paints that haven't sold and that they would be willing to donate (or sell of a fraction of retail price). Sometimes they will also donate brushes, tarps and other materials as well. 4) Visit construction sites and see if there is a supply of unused scrap lumber that you might be able to haul away rather than their having to dispose of it. 5) Contact your PTA / PTO and see if there would be a possibility of arranging a fundraiser for materials for the art department. 6) If there is no fee structure in place for students to take an art class, discuss the possibility with your administration. We charge $15 per person for each art class that we offer in my district which makes up approximately 50% of our budget. As the items that are used in an art class come under the category of 'consumables', the students can be charged a fee for them as they basically get to 'make and take' the work that is created as a result of the materials being purchased. There might be state legislation in your area that does not allow that, however, so it would be worth checking into. I teach in Minnesota and it is legal here. 7) Check out grant opportunities that are available for providing art materials to your students. Many large companies have such programs in place as part of initiatives to help give back to local communities. 8) Check lumber companies and mill shops for interesting scrap wood. Let the Industrial technology teacher know that you want wood scraps. Also let your students know you need scraps. Some parents may do wood craft projects and have interesting shapes cut out. 9) Check window repair shops (in hardware stores and lumber stores) for window screen and Plexiglas. Window screen can be used for sculpture an for making molds and deckles for paper making. 10) Check local frame shops for scrap foam core board and scrap mat board. National companies may not give it to you - but you can ask if you can retrieve it from their dumpster (they are required to throw it out now). 11) Collect corrugated cardboard from appliance stores. There are unlimited uses for corrugated cardboard. Use as "canvas" for painting and for sculpture (relief and in the round). 12) Dow foam board is great for sculpture. You can get free pieces of this from lumber yards (damages pieces) and left-overs from construction sites. 13) End rolls of newsprint from the local newspaper. 15) Foam trays from meat department for printmaking (some stores may donate these) limited possibilities. Make a nice ground for drawings... Great for paper mache... good for hand made paper (with some abaca or cotton linter added).